I just put a bunch of naturally dyed silk ribbon, trims, and yarn bundles on my etsy.com store You can view them over here http://www.prairiefibers.etsy.com/ I put up spring colors which really help to beat the winter doldrums! Each bundle consists of 18-22 strands that are approx 1 yard in length. 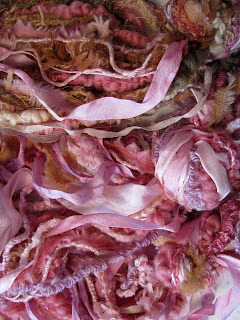 This is a photo of three bundles, all dyed with cochineal and or cutch! Some bundles contain pearl cotton that has also been dyed with natural dyes.